WHY „KOPŲ PERLAI“ („DUNE PEARLS“)? We had a vision to create apartments for luxurious rest in Palanga - a place where one, who is tired of city bustle and longing for exclusive rest, will feel good. We adjusted carefully apartments architecture and interiors in the way that they would not be detracted from wild coastal pine forest environment. 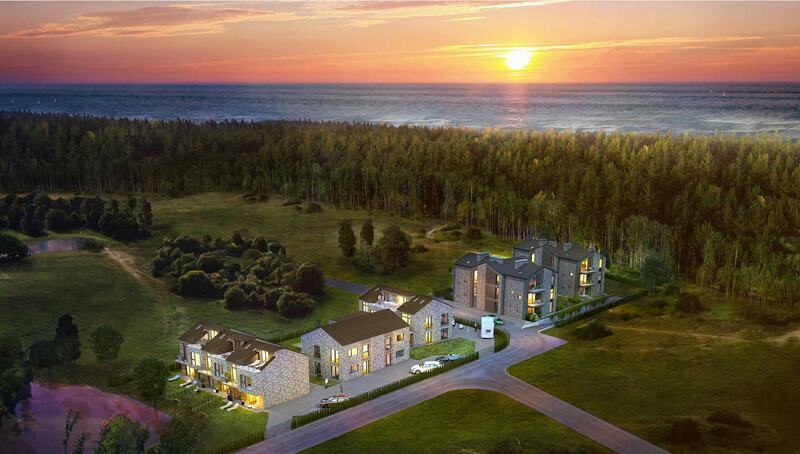 „Kopų perlai“– is a complex of five highest class houses, harmoniously merging with the natural coastal landscape. Dwellings are distinguished by their quality, excellent location (only 5 min to the sea) and the unspoken view through the windows. Construction start: 2015 IV quarter. The location for "Kopų perlai" was chosen intentionally. We searched long for a quiet and remote location, which is separated from the bustle of the city, and from where the pine forest and the sea can be reached in just a few minutes. From apartments to the city centre leads a great pine forest trail, so if you want, you can always reach lively and vibrant city centre on foot in just 20 minutes. Kopų Perlai apartments are sold with full finish. Our goal is to create visually attractive as well as functional living spaces, so the interior of the apartments is modern, cosy and convenient. Interior creation is entrusted to talented designer Agnė Stanikūnaitė and her studio "Factory." Exclusive attention is paid to Kopų Perlai architectural solutions. During the design of the dwellings it was intended to harmonize building architecture and the seaside landscape. The architectural solution is performed by „Vakarų regiono projektai“ Ltd team of architects, who successfully implemented a number of residential projects in Palanga and its surroundings. Kopų Perlai project implementation is carried out by VICI Investments Ltd - one of the Vičiūnai group companies. Vičiūnai group has implemented a number of successful real estate projects. Kopų Perlai will be located on Ajerų str. 30 and Ajerų str. 30A, in Palanga. This place is perfect for those who long for both active and passive rest. From this point everything what is beautiful at the seaside is reachable in just a few minutes – morning running by the coast, a wonderful afternoon walking in the pine forest, the sun and the sounds of the sea. Located a bit further, but easily reached by foot, there is a bustle of central streets of Palanga.